Supreme forum within the system of ordinary courts. The most important of the functions assigned by law to the Supreme Court of Justice is its position within the system of ordinary courts. The Supreme Court of Justice is the final appellate instance in civil and criminal proceedings (Art. 92 Para.1 of the Austrian Federal Constitution); thus, it is the supreme forum within the system of ordinary courts (Sec.1 Para.1 of the Federal Act on the Supreme Court of Justice or “Supreme Court Act”). Pursuant to the Federal Constitution and the Supreme Court Act, it would be in breach of the constitution to establish a further appellate forum for civil or criminal cases above the Supreme Court of Justice. However, this does not mean that an appeal must lie to the Supreme Court of Justice from all ordinary court proceedings. Restrictions (which, as a rule, are based on the significance of the subject-matter of the proceedings) may be imposed by ordinary statutes on the right of appeal at appellate levels below the Supreme Court. Indeed, this is the case under current law, in order to prevent the Supreme Court from being subjected to an excessive workload as it performs its comprehensive guiding role within the entire system of ordinary courts. ​As a general principle, the Supreme Court sits in panels (both in civil and in criminal cases) (Sec. 5 Supreme Court Act); unless otherwise provided by law, it does so in what are known as simple panels made up of a Chief Justice and four other members of the Supreme Court, i.e. five professional judges. Currently, the Supreme Court of Justice comprises eighteen panels, ten of which are responsible for decisions on final appeals in civil matters (panels 1-10), six for criminal cases (panels 11-15 and 17), while one acts as an Appellate Court for competition law cases (panel 16). However, the latter panel is made up of only three professional judges (unlike the normal make-up of a simple panel). In this case, the two other judges are replaced by two expert lay judges. Lay judges also sit on the Supreme Court pursuant to Sec. 11 Para. 1 of the Austrian Labour and Social Courts Act (here, again, in industrial and social cases, the Supreme Court panel, as appellate court, is composed of three professional judges and two expert lay judges). Since 2014, the Supreme Court also has original jurisdiction in arbitration proceedings such as the appointment of arbitrators or challenges of the arbitral award (panel 18). In certain cases (specified in Sec. 7 of the Supreme Court Act), the Supreme Court sits as a three-member panel composed of the chief justice and two other members of the Supreme Court. Three-member panels have jurisdiction over what are known as ‘ordination and delegation’ decisions, i.e. decisions of the Supreme Court vesting special jurisdiction in a particular court for purposes of a particular case, and decisions of an appellate court ordering the removal of a case from one court to another court of the same type. They also have jurisdiction over decisions based on the Basic Rights Complaint Act. Pursuant to Sec. 8 Para. 1 of the Supreme Court Act, a simple panel must be supplemented by adding a further six members of the Supreme Court (enlarged panel) if, following submission of the report, it holds by ruling that a decision on an issue of fundamental importance will depart from the Supreme Court’s consistent jurisprudence or from the last decision rendered on the issue by an enlarged panel, or that the jurisprudence of the Supreme Court has not given a uniform answer on a legal issue of fundamental importance. About 60 decisions have been rendered by enlarged panels since the Supreme Court Act came into effect on 1 January 1969. As a part of the overall ordinary court system, the Supreme Court performs a comprehensive guiding role consisting of the safeguarding of legal uniformity, legal certainty and the development of the law. In civil matters, the Supreme Court decides (exclusively on points of law) primarily on appeals (appeals against judgements of the appellate courts), recourse appeals (appeals against rulings by which the court of second instance amended, confirmed or set aside the decision of first instance) and on recourse appeals against certain formal rulings of the appellate courts. An appeal to the Supreme Court is subject to statutory limits based, for instance, on the amount in controversy in the appellate court proceedings, on the importance, in terms of the uniformity of the law, legal certainty or the development of the law, of the legal question in the proceedings in question, on an admissibility ruling issued by the appellate court or the assertion of certain grounds for granting leave for appeal to the Supreme Court. Where admissibility of the appeal to the Supreme Court depends on the amount in controversy, this amount must exceed Euro 4,000 in any event. In criminal cases, the Supreme Court primarily decides on nullity appeals (appeals from criminal verdicts passed by courts with lay assessors or jury trials) and associated appeals (against the imposition of penalties or findings relating to civil law claims), as well as on nullity appeals to preserve the integrity of the law filed by the Procurator General, on appeals regarding basic rights and other appeals from individual rulings of the regional appellate courts. In performing its role of guiding Austrian jurisprudence, the Supreme Court receives very important assistance from the Records Office, the Official Library (Central Library) and the Court Office (divided into a number of departments). The Records Office is responsible for recording and processing the decisions of the Supreme Court as part of a generally accessible database (Judicial Decision Documentation – JUDOK). This currently contains the full texts of over 95,000 decisions of the Supreme Court and over 120,000 legal synopses. Starting in February 1993, 336,000 file cards were transferred to an IT system as part of the upgrading of the Records Office. The system mainly consists of head-notes and the structuring and storing of the legal references of relevance to the decision according to legislative texts and concepts suitable for indexing purposes. The Records Office is staffed by judges working there for half of their time under the direction of a member of a Supreme Court from the field of civil or criminal law. These judges spend the other half of their time adjudicating cases at various courts. 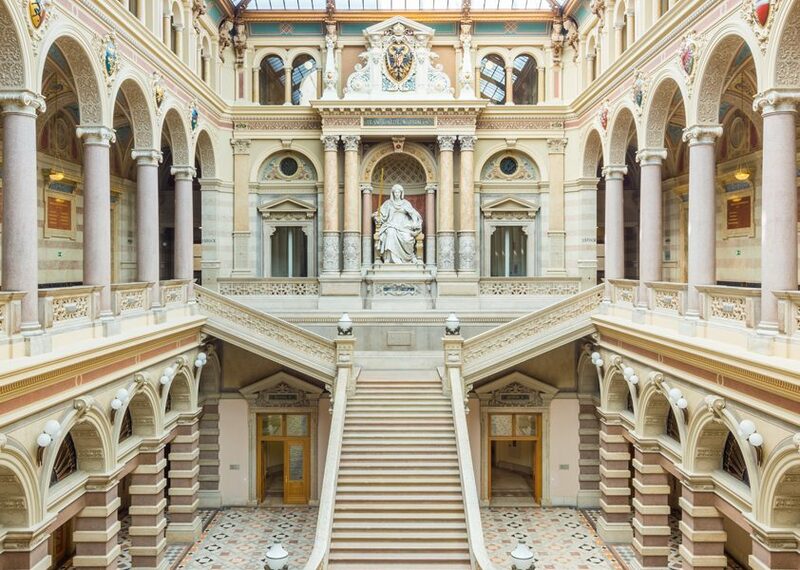 The Central Library which since 2002 has included the previously independent libraries of the Vienna Higher Regional Court of Appeal and the Vienna Regional Court for Civil Matters, comprises over 124,000 volumes, requiring ever-increasing amounts of space. These needs were addressed in the course of recent general renovations to the Palace of Justice, when the library area was relocated, and an underground book repository was constructed. A Reading Bridge was built over four columns in the courtyard of the Palace of Justice. It serves as a reading area and open access library, with approx. 1000 m of book storage space. The reading area is located along the glass-fronted outer wall, which creates a ‘link’ to the outside world, and provides an excellent source of natural light. A basement was constructed underneath the courtyard, and a book repository was created below the Reading Bridge, providing a further 5000 m of mobile bookshelves. The Reading Bridge is connected to the old Palace of Justice building by four glass bridges. One accesses the library today by passing directly from the main hall through a reception area, with exhibition areas and the historic library. Adjacent to the reception area on one side, there is a work room for the library staff, and on the other side, there is a reading room for lawyers. The Court Office, which provides indispensable assistance to the operations of the Supreme Court, is divided into a presidial department, one department each for civil and criminal (disciplinary and employment) cases and for the Records Office, the Payment Office, the Filing Office together with the delivery service and the Secretarial Department. In the course of legislative initiatives, the Supreme Court regularly issues opinions on draft legislation. For this purpose it maintains five panels, each dealing with different fields of law, three for civil law, one for criminal law and one for legal issues of interdisciplinary relevance. The Supreme Court of Justice also acts as the final employment and disciplinary court for judges and as a court of final appeal in disciplinary proceedings against notaries. The statutory provisions concerning disciplinary proceedings against solicitor-advocates also provide for the mandatory involvement of the Supreme Court, in that Sec. 59 Para.1 of the Disciplinary Rules provides that the Supreme Appeal and Disciplinary Commission for solicitor-advocates and solicitor-advocates in training must include at least eight and a maximum of sixteen justices of the Supreme Court of Justice.